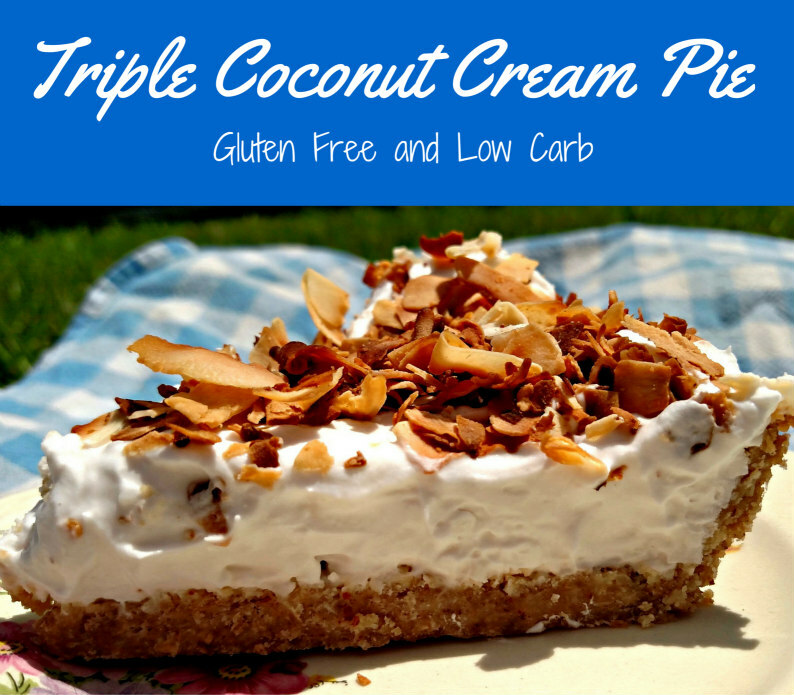 Creamy Low Carb Coconut Pie, Yum! I believe there are two camps of people in the world. Those who like coconut, and those who can’t stand it. I happen to be in the I-couldn’t-live-without-coconut camp. 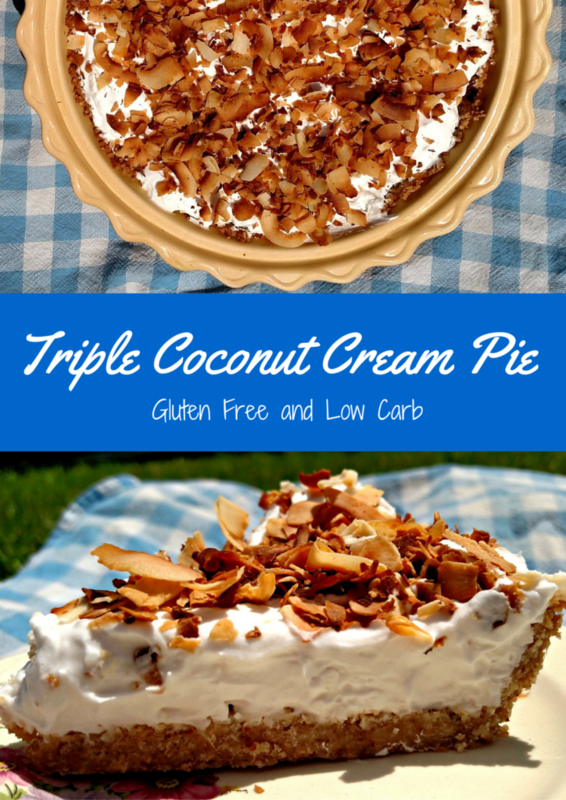 My low carb coconut pie has triple the coconut goodness that will make any coconut lover swoon. I love to bake, but I’m not always one for spending a bunch of time on an everyday recipe. I think that’s why lately I’ve been turning to icebox pies, like my strawberry cream pie I made a few weeks ago. 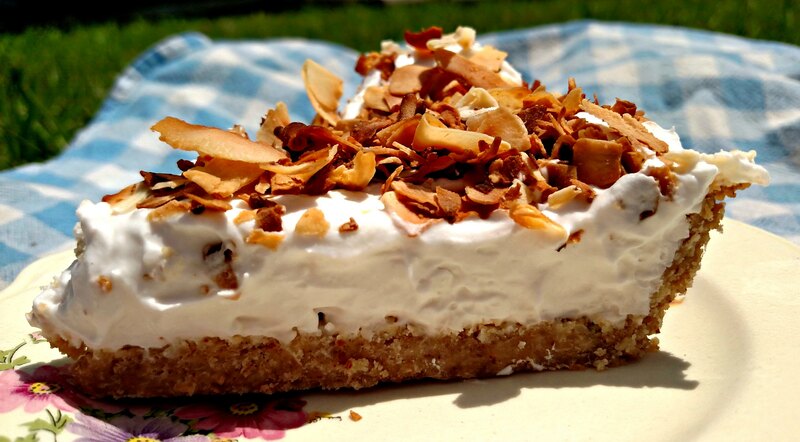 This low carb coconut pie is an easy, no bake summer dessert. 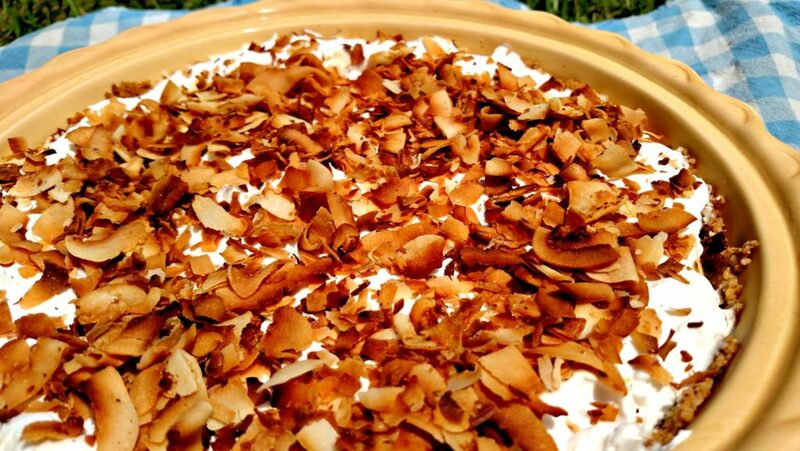 I wanted a coconut cream pie that was cool and creamy chocked full of coconut. This pie ticks all the right boxes! Refrigerate coconut cream for at least 24 hours. In a food processor pulse nuts until very fine. Add in almond flour, golden monk fruit and 1 cup shredded coconut. Blend until it's finely ground. Think crushed graham cracker consistency. Pour in melted butter or coconut oil. Blend until it starts to clump. Press into a 9 inch deep pie plate. Bake at 350F for 10 minutes or until brown. If using canned full fat coconut milk, separate the liquid from the hardened cream. Next, beat coconut cream and powdered Swerve in a stand mixer until stiff. Gently fold in the remaining 1 cup of shredded coconut to the cream. Spoon coconut mixture into the cooled pie crust. Refrigerate for at least two hours. Garnish with toasted chipped coconut. This crust is based on a recipe I saw in an old Kraft magazine that used crushed shortbread cookies, sweetened coconut, and nuts. The shortbread cookies had to go, but I wasn’t sure what to replace them with. I wanted to keep things simple. I finally decided to settle on using 1/4 cup almond flour in place of the cookies, and organic unsweetened shredded coconut in place of the sweetened coconut. For sweetener, I used golden monk fruit because it gives the crust a more golden color and I find it doesn’t have a funky aftertaste either. Pulse the nuts in a food processor until fine. Add the sweetener, coconut, and almond flour. Blend until you have course crumbs. Add the butter or coconut oil and press into a 9 inch deep dish pie plate. Now, don’t go buy a carton coconut milk in the refrigerator section of your grocery store because it won’t work in this recipe. You have to use canned coconut milk that has no other ingredients other than coconut milk and water. That’s sometimes hard to find, and I’ve found pure coconut cream from Amazon works a lot better anyway because I don’t have to drain off any liquid. If you do used canned coconut milk, refrigerate for 24 hours. When you’re ready to make your low carb coconut pie, open the can and scoop out the solid cream that’s formed at the top of the can into the mixing bowl. Save the watery part for smoothies or popsicles. Beat the cream from two cans and powdered Swerve into stiff peaks and follow the recipe as normal. Liquid sweeteners, such as stevia glycerite or xylitol maple syrup can be used instead of Swerve. Granulated sweeteners do not work well in this recipe. One thing that’s bugged me about baking since I went low carb is the complexity of a lot of the recipes. I just want to make desserts as quick as I used to make gluten and carb laden goodies. 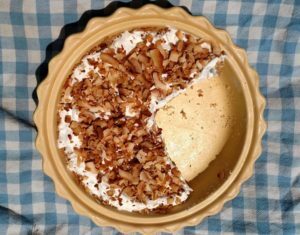 That’s why I like this low carb coconut pie recipe. Quick, easy, and minimal ingredients. If you looking for simple low carb goodies, take a look at my easy low carb desserts page. Our days are filled with work and family obligations, and at the end of the day baking shouldn’t take up our precious family time. 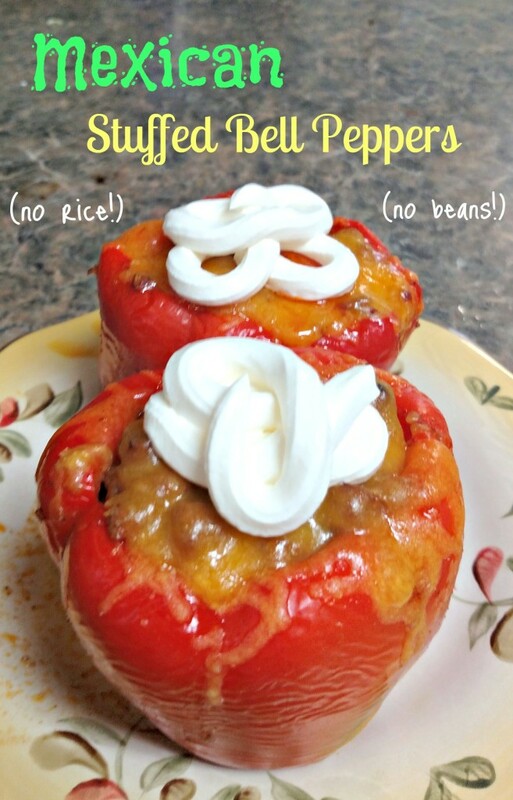 Gluten Free Low Carb Stuffed Bell Peppers WITHOUT Rice! So I was craving me some Mexican the other day and didn’t know what to fix. I had already bought ingredients for stuffed bell peppers because it was on my menu for the week. I didn’t want to go to the store, so I decided to be a domestic diva and work with the ingredients I had on hand. Ta da! 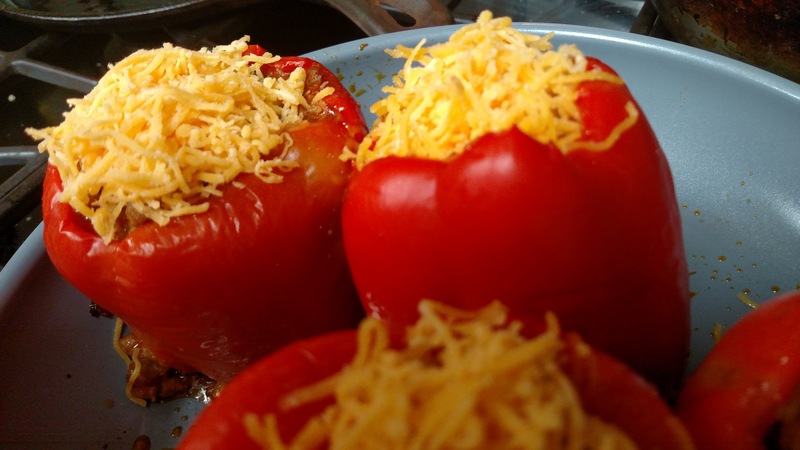 Low carb stuffed bell peppers Mexican style was born. Minus the rice and beans, of course. 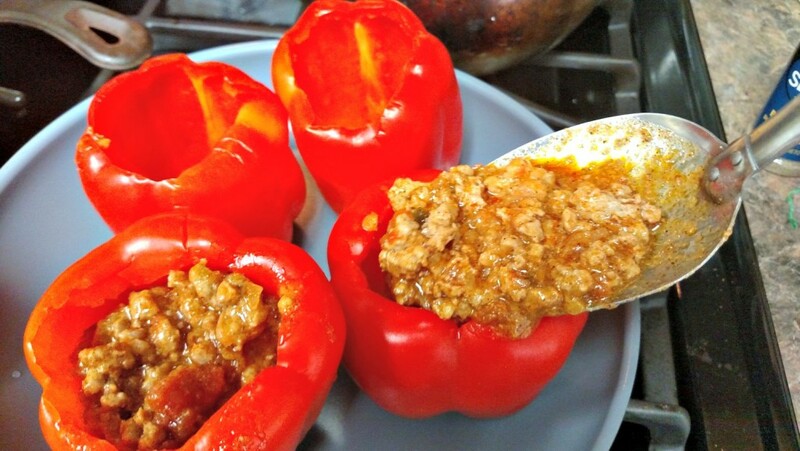 Stuffed Bell Peppers? Mexican Anyone? My husband isn’t a fan of Mexican food, but I could eat it every night of the week. He loves me though, so he doesn’t fuss when I fix Mexican every couple of weeks. He’ll eat it, just for me. But I think I won him over with this recipe, though. I had to fight him over the leftovers the next day. 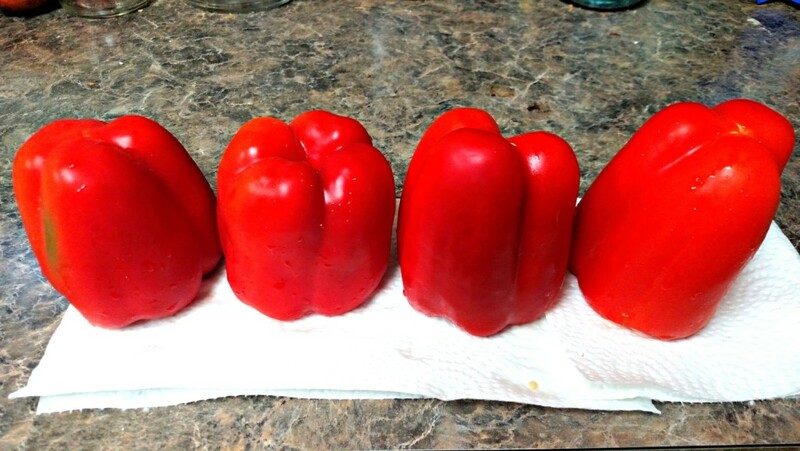 Preheat the oven to 350 F. This recipe makes four to five stuffed peppers, depending on how big your peppers are. You can use red, yellow, or green peppers. I personally like the red because they’re so bright and pretty. Cut the tops off of the peppers and remove the seeds and white membranes. Rinse and turn upside down on paper towels to drain. Fill a large pot with water and bring it to boil. Add the peppers and set a timer for five minutes. Remove and turn upside down on paper towels to drain. Brown 1 pound hamburger, 3 cloves of minced garlic, and a finely chopped onion in a large skillet. Add 1 8oz jar of your favorite chunky salsa, 2 tsp cumin, and 2 tsp chili powder. Or add two teaspoons of Mexican blend spice instead. Remove from heat and add 1 cup of shredded sharp cheddar cheese. Stir until melted. Put the peppers into an oven safe non-stick skillet and fill with the hamburger mixture. Cook in a 350 F oven for 12-15 minutes, or until heated through. Remove from oven and top with shredded cheddar cheese and return to the oven. Bake for 5 more minutes or until the cheese is melted. Cut the tops off of the peppers and remove the seeds. Rinse, and drain on paper towels. Fill a large stock pot with water and bring to a boil and add the peppers. 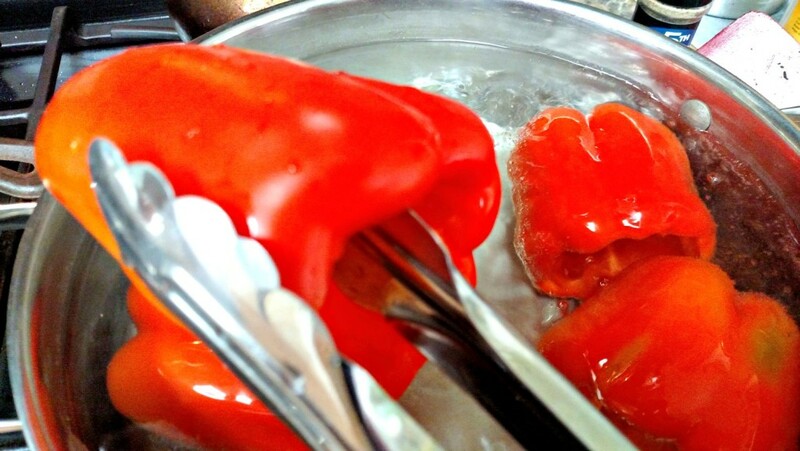 Boil the peppers for five minutes, and remove and drain. Brown ground beef, onions, and garlic. Drain if necessary. Return to heat and add the salsa and spices. Remove from heat and add 1 cup of cheese. Stir until melted. 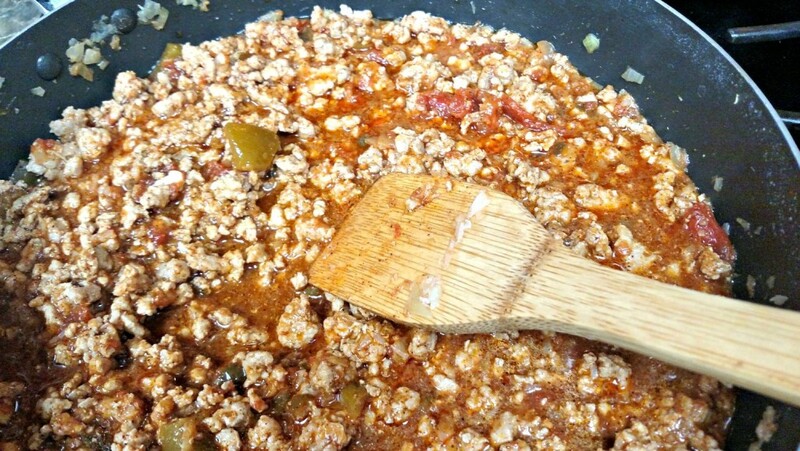 Stuff peppers with the meat mixture. Bake the peppers for 15 minutes, or until heated through. Remove from oven and top with more shredded cheese. Return to oven for five more minutes, or until the cheese is melted.